On December 17, 2010, President Obama issued which created the Pathways Program. It was done to help the federal government better compete with the private sector for employees who lack significant and relevant prior work experience. 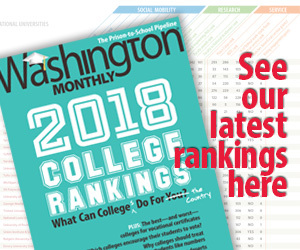 In the September/October of the Washington Monthly, Rachel Cohen has a piece on How to Find a Job with Uncle Sam that details how the Pathways programs work in practice. The Internship Program, designed for current students, provides paid work opportunities in federal agencies for a limited period of time. Interns can work either on a part-time or full-time basis. Next there is the Recent Graduates Program, which is open to individuals who have completed, within the previous two years, an associate’s, bachelor’s, master’s, professional, doctorate, vocational, or technical degree or certificate from a qualifying educational institution. These recent graduates can work in federal agencies while also taking advantage of substantial career training and mentorship opportunities. Lastly, the Presidential Management Fellows Program is a leadership and career-development program for those with newly minted graduate degrees. In all three divisions of the Pathways Programs, if you successfully complete the term of service you can receive what is known as “noncompetitive eligibility” when applying for federal jobs. This means that your employer can convert you straight from a Pathways participant into a permanent employee or you can apply for other federal positions without having to go through the standard, and highly competitive, USAJOBS application process. The advantages of these programs are that they give you a better chance of landing a job within the Federal Government and that they give you an opportunity to learn the culture of our various bureaucracies in advance so that you can determine if they are a good fit for you. Prior to the issuance of this executive order, the Federal Government heavily favored applicants with significant prior work experience, which made it difficult for college students and recent graduates to get employment.